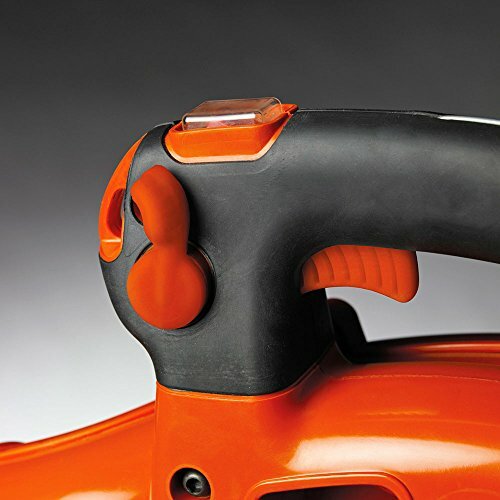 Husqvarna has a long history of manufacturing outdoor power tools and has made a mark in gardening equipments as well. If you are not the one who would love raking leaves and the exercise involved in it, then the Husqvarna handheld blowers are the perfect alternative. The Husqvarna 125B E-tech is a light-weight, efficient, hand-held, gas powered leaf blower. The first thing that you need to worry while using a hand held leaf blower is the comfort with which you can use it. This light-weight leaf blower is compact and weighs 9.4 lbs. The light weight of the blower is achieved by the use of sturdy plastic that effectively keeps the overall weight in control while retaining the sturdiness of the product. The blower is ergonomically designed so that there is minimal fatigue even after prolonged use. The fan housing of the 125 B has been engineered on the right side so that the air stream is in line with the handle. This minimizes the vibrations and rotational force that may affect the wrist and arm and saves you from the sore joints even after long hours. The in-line design is featured to remove maximum stress and to give you a comfortable handling facility. In addition, there is a cruise control switch with which you can control the speed of the fan and set it for easy handling and an adjustable handle with a soft grip. These add on to the stress free effect of the design. Husqvarna was once famous for making some amazing two-stroke motorcycles back in time. They have since then used their expertise in lawn equipments and the Husqvarna 125B leaf blower has been powered with a 1.1hp engine that is capable of going up to 8000 rotations per minute and can produce wind speeds of 170mph. At this high speed, large volumes of air gush out through the tube and can give you a CFM rating of up to 425. The engine burns fuel at a rate of 575g/kWh which is considered to be high on the efficiency scale and combined with a 16.91 oz fuel tank, the blower can be used for long hours without worrying about refueling it. The Husqvarna 125B E-Tech is equipped with a host of advanced premium features to suit the needs of homeowners as well as professionals. The Husqvarna 125B E-Tech comes with an adjustable blowing tube. You can adjust the length of the blowing tube to suit the different requirements in the yard. This length optimization comes extremely handy and is an essential feature of the blower. In addition you can choose from two sets of nozzles, the rounded one for normal regular use and the flat one when you require a more concentrated blast of air. The Husqvarna 125B E-Tech features an auto return stop switch that returns to the “On” position automatically which makes starting the blower easy. The blower controls are all contained in a easy to access panel so that they can be reached easily without any effort along with a cruise control switch that locks the speed of the fan enabling you to operate at a constant speed without much hassle. You do not have to regulate the speed of the blower constantly. The Husqvarna 125B E-tech comes with a vacuum kit. With this you can convert your leaf blower to a lawn vacuum in no time. A vacuum bag collects the debris after they are reduced to small pieces by the mulching knives that come into play in the vacuum mode. But removing wet debris is not recommended. In such a case you should use the blower to gather them and then vacuum them only when they are dry to prevent clogging. This feature removes the air from the carburetor and fuel system enabling easy starting of the blower. The Husqvarna 125B E-Tech comes with a two year warranty and the warranty can be extended to four years if you register the product online. The warranty includes labor and parts. So these are the essential features that the Husqvarna 125B E-Tech boasts of and now let’s have a look at how it performs on the field based on the various reviews of the people who have used it personally. This compact lightweight leaf blower is packed with power and can handle heavier debris with equal ease. Sticks and pine needles can be even swept away with this powerful blower. But such power comes with a prominent noise of about 94 decibels close to the operator’s ear. You can wave off the sound by using earplugs but be prepared to hear complaints from neighbours. Though the control panel is easy to access you can miss out on the choke placement which could have been more intuitive. The unit is quiet easy to start when properly maintained but the major drawback of this equipment is the fuel mix required by the engine. So with an overall knowledge of the Husqvarna 125B E-tech leaf blower we can come to the conclusion that if the fuel mix is used as recommended by the manufacturer and with regular maintenance this light weight compact yet powerful gas powered leaf blower can be the ideal choice if you can do away with the noise that it comes with.